Perinatal autopsy remains the gold-standard procedure used to establish the fetal, neonatal or infant abnormalities. Progressively, perinatal pathology has become a specialized field with important roles of audit for fetal prenatal diagnostic tools, in parents counseling regarding future pregnancies, in scientific research, for epidemiology of congenital abnormalities and teaching. The differences between prenatal ultrasound and autopsy reports represent a strong argument for the autopsy examination following termination of pregnancy. The reasons for such discrepancies are related to the ultrasonographic or pathological examination conditions, the type of the anomalies, the expertise and availability of the operators. Several facts led to an undesirable increase of refusals from parents to consent to a conventional invasive autopsy: the centralization of pathology services, the poor counseling provided by non-experts in fetal medicine and the clinicians over-appreciation of the importance of the ultrasound diagnostic investigation. Although non-invasive alternatives have been tested with promising results, conventional autopsy remains the gold standard technique for the prenatal diagnosis audit. We report and analyze several cases of prenatally diagnosed malformed fetuses with different particularities that underline the necessity of perinatal autopsy. We discuss the antenatal findings and management and post-mortem autopsies in the respective pregnancies. Since they were described, gastrointestinal stromal tumors (GISTs) are, for pathologists and not only for them, a subject of controversy regarding histological origin, differentiation, nomenclature, malignant potential and prognosis. Before 1998, there were no certainties that GISTs were fundamentally different from other types of abdominal cancers in the big family of mesenchymal tumors. Before the discovery of KIT gene mutations, GISTs were most often classified as leiomyoma, leiomyosarcoma, leiomyoblastoma, and gastrointestinal autonomic nerve tumor. When a tumor is discovered, the first data obtained are initially assessed by one or more imaging tests, such as an ultrasound, computed tomography scan or magnetic resonance imaging. The imaging results define the size of the lesion and its anatomic location, which in the case of GIST is usually within the wall of the stomach or intestine. Depending on the experience of the medical team - radiologist, gastroenterologist or surgeon - reviewing the imagistic tests and correlating them with the general patient profile, the differential diagnostic is reduced and GIST may become the main suspect. Glaucoma is a clinical entity with multifactorial etiology, a severe subtype occurs in infancy called primary congenital glaucoma (PCG). Three distinct levels interact sequentially to produce PCG: (i) genetic mutations mainly affecting the CYP1B1 gene, (ii) absence or dysregulation of a morphogen, and (iii) trabecular meshwork pathological changes either in patterning or remodeling. We will discuss these three levels in detail towards further understanding of the morphological basis of the disease, focusing on the missing points, for instance the exact nature and function of the morphogen along with the putative role of CYP1B1 gene. Amniotic membrane (AM) transplantation has been used successfully worldwide in ophthalmology plastic surgery for over 100 years. This review presents the histological and the immunohistochemical features of AM compared to those of the conjunctiva and discusses the techniques of processing and preservation, its mechanism of action in ocular reconstruction, its clinical ophthalmic indications, but also advantages and limitations of grafting with this biomaterial. Chronic diarrhea in infants is a common condition for addressability to pediatric gastroenterologists. The causes are multiple and the delay in reaching the final diagnosis can lead to complications in the general condition of the child. The purpose of this review is to present the bio-clinical and histogenetic particularities of a rare clinical entity, characterized by tumoral causes of chronic diarrhea. VIPomas are neuroendocrine tumors that autonomously secrete vasoactive intestinal peptide (VIP). Watery diarrhea, hypokalemia and achlorhydria (WDHA) syndrome caused by VIP-producing tumors only rarely occurs in adult patients with non-pancreatic disease. In pediatric patients, it is extremely rare for a VIPoma to originate in the pancreas; instead, WDHA syndrome is usually associated with VIP-secreting neurogenic tumors involving the retroperitoneum or mediastinum. The majority of VIP secreting tumors in pediatric patients are represented by ganglioneuroblastomas or ganglioneuromas originating in the adrenal medulla or sympathetic neural crest. This syndrome of watery diarrhea associated with hypokalemia and achlorhydria was first described by Verner and Morrison, in 1958, and has been assumed to be due to hypersecretion of VIP. In children, as well as in adult patients, the most likely explanation for persistent secretory diarrhea may be an occult VIPoma. In conclusion, the physicians should be aware that there are some rare tumoral causes of chronic diarrhea, often under-diagnosed. If the diagnosis is not considered, extensive gastrointestinal investigations will be undertaken, delaying the diagnosis and avoidable morbidity will occur. Establishing the postmortem interval (PMI) is vital in legal medicine as it allows to retrospectively estimate the hour of death, which is essential for the police as a starting point for their inquiries (especially in violent deaths). Ultrastructure studies aimed specifically to detect autolytic changes are scarcely identified in the scientific literature. Moreover, they are performed in a variety of conditions (different temperatures, species, in vitro / in situ, and so on), making the results difficult to interpret for legal medicine purposes. The main aim of this review is to determine the potential usefulness of ultrastructure studies for the estimation of the postmortem interval and to provide a summary of relevant scientific literature in the area, which might be useful as a starting point for more specific and detailed studies in the field. We performed a search on the ISI Thomson Web of Knowledge database using a series of predefined keywords; the articles fulfilling the inclusion criteria were systematically analyzed to identify ultrastructure changes associated with autolysis. Our investigation revealed 20 relevant articles, which detailed ultrastructure changes in the brain, heart, liver, pancreas, kidney, bone, sweat glands, thyroid, skeletal muscle, cartilage and sweat glands. For each organ, we arranged systematically postmortem ultrastructure changes that were described by various authors. Ultrastructure changes appear early and may be useful in determining the time since death in the early postmortem interval. However, most studies published in this area followed methodologies that could not allow a proper reproducibility in forensic circumstances. Therefore, before using ultrastructure for estimating the PMI in practical environments, further studies are needed. They should be performed ideally on human samples, obtained at regular intervals after death, at variable, decreasing temperatures. Tuberculosis (TB) is a global health issue, with a rising incidence since the beginning of this century. It poses a severe mortality risk and also poses a serious economic risk as it reduces the working capacity of an individual in the most productive part of life. Developing countries face widespread tuberculosis infection - up to 95% of all cases and 98% of deaths, respectively. It is a highly contagious infectious disease caused by Mycobacterium tuberculosis (the Koch bacillus) that can be contracted from either humans or animal hosts. Infection is also associated with immunodepressive conditions and can be contacted through airborne, digestive, cutaneous or other routes of transmission. Pulmonary TB can be either primary - when events follow a first contact between the organism and the bacillus, and secondary - in case of a reactivation of a latent primary infection. One of the aims of this review is to present the current epidemiological data of TB infections in Romania, compared to the rest of the world, with an analysis of associated conditions and extra-respiratory TB infections. One of the main conclusions of our review is that optimal management of this complex disease can only be achieved through a coherent national prevention and treatment program, with centralized financing and sufficient epidemiological, imaging and laboratory support, in conjunction with good patient compliance. Introduction: Sacral tumors encompass numerous histopathological types. They represent an uncommon pathology and, when diagnosed, they are often in advanced stage of the disease, becoming a therapeutic challenge. The correct treatment of a sacral tumor should be established by a multidisciplinary team that will assess the exact anatomical, imagistic and histopathological characteristic of the tumors thus choosing an optimal surgical approach while taking into consideration the risk of recurrence. Material and Methods: We conducted a retrospective analysis of both primitive and metastatic sacral tumors in Bagdasar-Arseni Emergency Hospital, Bucharest, Romania, for a period of 10 years, studying demographic data, clinical signs, anatomical and histopathological features as well as surgical approach and postoperative prognosis. Results: Sacral tumors were diagnosed with a peak incidence in the age group 60-69 years, being more frequent in women. Primitive sacral tumor was predominant and, in this subgroup, chordoma was the most frequent. Metastatic tumors appeared in older subjects. None of the histopathological types associated a preferred topography of the resection or increased resectability. Posterior surgical approach was chosen in most cases, total resection being a hard goal to accomplish due to the invasion of vascular and nervous structures. Bleeding was the most frequently reported incident, carcinomas recording the highest blood loss amongst primitive tumors. Overall prognosis was clearly favorable for subjects diagnosed with primitive sacral tumors. Conclusions: Interpreting imaging data in a clinical context, paying attention to histopathological examination and knowing each histological type characteristics is mandatory in choosing the surgical approach thus obtaining the best postoperative outcome possible. Sjogren s syndrome (SS) is an autoimmune disease characterized by hypofunction of the salivary and lachrymal glands. Main clinical features of SS are sicca symptoms, due to the altered glandular function. Also, in advanced stages, bilateral swelling of the parotid glands can be noted, indicative of severe glandular involvement. Phenotypic expression of various mononuclear cells present in the affected tissue offers additional insight into cellular proliferation, survival, migration, antibody secretion and also the potential of forming tertiary lymphoid tissue, i.e., germinal centers. The main objective of the present study was to evaluate various autoimmune activity patterns present in salivary glands by means of immunohistochemistry (IHC) analysis. The study group comprised of 10 primary SS patients, with various degrees of lymphocytic infiltrates confirmed on minor salivary gland (MSG) biopsy. We could identify both morphological changes, i.e., ductal system abnormalities or increased interstitial fibrosis, and immunological patterns associated with SS pathogenesis. CD3+ T-cells displayed a more intense reaction in specimens with mild to intermediate focus score (FS) grade. Specimens with important CD20+ B-cell component of lymphocytic infiltrate were associated with intermediate and severe FS grade. Specimens showed varying degrees of CD68+ cells, with more intense IHC reactions in slides displaying a more advanced mononuclear infiltration. Immunoreactivity was strong for both MMP-2 and MMP-8 matrix metalloproteinases, throughout the gland, in areas of acini, without it being linked with proximity of mononuclear cell infiltration. We could also establish some correlations between the degree of lymphocytic infiltration and clinical profile. Objectives: Schizophrenia is a brain disorder that affects more than 21 million people worldwide. Ventricle enlargement and reduction in the volume of the temporal lobe overall and in medial temporal structures constitutes the main macroscopic findings, whilst synaptic and spinal changes as well as gliosis in the hippocampal formation, the prefrontal and the entorhinal cortex stand among cardinal microscopic findings in the schizophrenic brains. In recent years, accumulated evidence comes to light about the role of cerebellum in the pathophysiology of schizophrenia. Materials and Methods: The present study is based on the morphological analysis and 3D neuronal reconstruction of the Purkinje cells from 10 schizophrenic brains and 10 normal controls. Results: Significant morphological alterations such as loss of distal and terminal dendritic branches and decrease of the density of the dendritic spines constitute the main morphological findings found in the present study. Conclusions: The present findings may be added to accumulated evidence on macroscopic and microscopic pathology of the cerebellum in schizophrenia. Morphological alterations of Purkinje cells seem to be a central feature of neuropathology of schizophrenia, reflecting to impairment of neuronal connectivity and functionality, and related to motor and cognitive symptoms. Aim: The main objective of the study was to highlight the histopathological aspects of some rare forms of facial basal cell carcinomas. Patients, Materials and Methods: The 65 selected patients were diagnosed with head basal cell carcinoma (BCC), during 2011-2013, and they underwent surgery. The excised tumor tissue fragments were processed for paraffin embedding and stained with Hematoxylin-Eosin (HE), Masson s trichrome with Aniline Blue, and Alcian Blue-Periodic Acid Schiff (AB-PAS). Results: The youngest patient was 23 years old, while the oldest was 91 years. The facial BCC there was slightly higher prevalence in males of 34 out of 65 cases. Histopathologically, great varieties of morphological types have been identified in the 65 cases investigated. According to our data, by far the most common are nodular BCCs type, which represented 44.6% from the investigated cases, followed at some distance by morpheiform and superficial subtypes with 13.8% and 10.7%, respectively. The most rare cases of facial BCCs were: cystic, adenoid, fibroepithelial and basal with adnexal differentiation with in one single case each. Relatively rare were the following varieties: pigmented (four cases), combinations of several forms (four cases), metatypical (three cases), keratotic (three cases), and micronodular (two cases). Conclusions: Within the limits of this study, the data reported here shown that such a lesional pleomorphism very often requires to make a careful differential diagnosis with a number of other tumor or non-tumor entities. p16/Ki-67 dual-stained cytology, either alone or combined with human papillomavirus (HPV) 16/18 genotyping, could be a useful tool for triage for colposcopy of HPV-positive patients. Based on this background, we aimed at comparing the diagnostic performance of the p16/Ki-67 dual staining test, and high-risk HPV test for the detection of high-risk cervical intraepithelial neoplasia (CIN2/3) in patients diagnosed with low-grade squamous intraepithelial lesion (LSIL) on Pap smear. We performed a retrospective study including 184 patients with LSIL cytology on Pap smear, of which 64 were referred for biopsy after colposcopy. Prior biopsy HPV genotyping and dual staining test were performed on all 64 patients. The mean age of the patients selected for conization was 36 years and seven months. The pathological exam showed that 28.13% (18/64) from the patients LSIL on cytology were actually having CIN2/3: 12 cases with CIN2, five cases with CIN3 and one case of in situ cervical carcinoma. HPV positive were 56.25% (36/64) of the patients with LSIL. The p16/Ki-67 dual staining test was positive in 29.69% (19/64) of the patients with LSIL. Among women with LSIL cytology, the sensitivity and specificity of the HPV genotyping test for predicting CIN2/CIN3 were 94.44% (17/18) and 58.7% (27/46), respectively. The sensitivity and specificity of the p16/Ki-67 dual staining test were 66.67% (12/18) and 84.78% (39/46), respectively. Our results agree with other data available in literature and suggest that the p16/Ki-67 dual staining test could be included in the management protocol of patients with modified cytology as a triage test before referring those patients for colposcopy. The identification and validation of new, complementary prognostic factors represents a challenging issue in thyroid pathology, opening the perspective of papillary thyroid carcinoma (PTC) stratification based on differences of aggressiveness at molecular level. Our study aims to analyze the HER-2/neu expression in different subtypes of PTC and its relationship with the classical clinicopathological factors. We investigated 120 cases of sporadic PTC. The cases were selected based on the histological criteria reported to clinical course and prognosis and distributed in two different subgroups, namely low- and high-risk. HER-2/neu expression was assessed using an adapted semiquantitative score proposed for thyroid carcinomas. The correlations between HER-2/neu expression and clinicopathological prognostic factors were statistically analyzed. HER-2/neu positivity was found in 25 (20.8%) cases, from which 20 cases were classified as subtypes with low-risk and five with high-risk; 95 (79.2%) cases were HER-2/neu negative, 53 cases being included in low- and 42 cases, respectively, in high-risk group. HER-2/neu expression was significantly associated with histological subtypes, extrathyroidal extension, and tumor focality. Our results highlight the potential of HER-2/neu as supplementary marker useful for the stratification of PTC in low-risk and high-risk histological groups, along with the well-known clinicopathological prognostic factors. Our data could be considered as new evidences that indicate different involvement of HER-2/neu in tumor development and behavior, possible due to its connection with other factors present in the molecular environment. In this paper, we focus our interest on the dynamics alterations of the tumor-stroma interface at the ultrastructural level and to detect BRCA1 and BRCA2 mutations using next generation sequencing (NGS) of breast tumor tissue. Electron microscopic investigation revealed some peculiar infrastructural alterations of the tumor cells per se as well as of the tumor-stroma interface: invadopodia, shedding microvesicles, altered morphology and reduced number of telocytes, different abnormalities of the microvasculature. Tumor suppressor genes BRCA1 and BRCA2 are the genes with most hereditary predisposition to breast and ovarian cancer. An early identification of mutation within these genes is essential for determining classification and therapeutic approach to patients. Genetic tests used to determine mutations in BRCA1 and BRCA2 genes are laborious analysis methods which include, among others, NGS. We analyzed a total of eight samples, in which genomic DNA was amplified using Ion AmpliSeq panel BRCA1 and BRCA2. DNA libraries were created, amplified and sequenced with Ion Torrent Personal Genome Machine. The bio-information data obtained allow us to detect all known pathogenic mutation and uncertain polymorphisms. This work was aimed to analyze the versatility of the chick embryo chorioallantoic membrane (CAM) as in vivo model for the study of the malignant pleural mesothelioma (MPM) and the therapeutic potential of Fe3O4/salicylic acid magnetic nanoparticles (SaMNPs) on MPM cells. The antitumor effects of SaMNPs were studied by in vitro and in vivo tests on CARM-L12 TG3 rat malignant mesothelioma cells and human MPM xenografts implanted on CAMs. In order to assess the human MPM xenograft growth characteristics, calretinin, HBME-1 (Hector Battifora mesothelial epitope-1), and cytokeratins immunohistochemical stainings were performed. The human MPM xenografts continue to develop on the CAMs and xenograft MPM cells showed highly metastatic features and a particular pattern of metastasis. The SaMNPs had a specific uptake by the MPM cells and an antiproliferative effect at therapeutic doses greater than 100 micro-g/mL. The results confirmed the possibility to use the CAM as in vivo model to study the biology of MPM and to evaluate the antitumor potential of new therapeutic agents. They highlighted a strong antitumor effect of the SaMNPs on the rat and human MPM cells and open new perspectives in the treatment of MPM. Introduction: Osteoarthritis (OA) represents a public health challenge since the pathogenic treatment, able to induce cartilage regeneration, still remains unknown. Ageing of the population and increasing OA prevalence have led to a lot of research, aiming to identify treatments acting on chondrocytes that play a determinant role in cartilage degeneration/regeneration balance. Pulsed shortwave therapy (with the classical application form - Diapulse) is a physiotherapy method with anabolic effects demonstrated on nervous, conjunctive and vascular tissues, but its effects on OA cartilage are not known. Aim: Our aim was to demonstrate the effects of Diapulse on the cartilage in experimental induced OA. Materials and Methods: Experimental OA was induced in 10 mature female rabbits by anterior cruciate ligament transection (ACLT). Ten weeks after ACLT, rabbits were randomized in a treatment group and a control group. Treatment group was exposed to Diapulse at a frequency of 27.12 MHz, pulse length of 65 micro-s, pulse frequency of 300 pulses/s (300 Hz) for 10 minutes/day. Control group was exposed to sham therapy. After treatment, rabbits were sacrificed and the cartilage was evaluated by histopathological examinations with Hematoxylin-Eosin (HE) staining and transmission electron microscopy (TEM). Results: OA characteristic changes were found in both groups. In the treatment group, we found that Diapulse influenced the degenerative process in the OA cartilage by improving the chondrocyte viability and the capacity to maintain cellular matrix integrity and structure. Conclusions: Diapulse can be considered a disease modifying therapeutic procedure and could be a reliable option for treatment of OA patients. Aim: The aim of our study was to assess glial fibrillary acidic protein (GFAP) glial cell phenotype in the enteric nervous system (ENS) in colorectal adenocarcinoma of different tumor grading and, also, to establish correlations between these changes and the tumor proliferative activity and the tumor-infiltrating leukocytes. Patients, Materials and Methods: We ran an observational, prospective study on a group of 52 patients diagnosed with colorectal adenocarcinoma. They were surgically treated in the 1st Surgery Clinic of the Emergency County Hospital of Craiova, Romania. From the surgically resected pieces, after pathological confirmation and tumor grading, 3-micro-m thick seriate sections were cut and processed for immunohistochemistry for detecting GFAP, S100, CD45 and Ki-67. Results: Evaluation of GFAP glial cell type in the ENS of colorectal cancer with different stages of differentiation showed that the density of these nervous elements is higher in well-differentiated (G1) colorectal tumors compared to moderately differentiated (G2) and poorly differentiated (G3) colorectal tumors. For well-differentiated colorectal adenocarcinoma, we did not find any correlations between GFAP glial cell type in the ENS and the tumor proliferative activity or with tumor-infiltrating leukocytes. In what the moderately and poorly differentiated adenocarcinoma are concerned, we found a high inverse variation between GFAP glial cell type in the ENS and the proliferative activity, on one hand, and, between GFAP glial cell type in the ENS and the tumor-infiltrating leukocytes, on the other hand. Conclusions: The decrease in the density of GFAP glial cell type in the ENS with tumor grading of colorectal cancer and the inverse variation with the tumor proliferative activity and with the tumor-infiltrating leukocytes might serve as putative prognostic factors in colorectal cancer. Aim: Highlighting certain characteristics of T- and B-lymphocytes, as well as of vascular endothelial growth factor-A (VEGF-A) as a prognosis factors for patients suffering from acute pancreatitis, with the scope of establishing diagnosis and therapy. Materials and Methods: Pancreatic tissue samples were analyzed, originating from 21 patients deceased due to acute pancreatitis, between the years 2015 and 2016. The study group was subdivided into two subgroups by pathology duration. As control group, pancreatic tissue fragments were sampled from eight patients, deceased due to non-pancreatic acute surgical abdomen (NPASA). Results: By analyzing the immunohistochemical expression of T-lymphocytes (immunomarked with the anti-CD3 antibody) and of B-lymphocytes (immunomarked with the anti-CD20 antibody), both on the tissue sections originating from the study patients, as well as the control group patients, we established that these were mostly present in the interstitium, following which the acini, less frequently in the islets, in general with B-lymphocytes being less present than T-lymphocytes. VEGF-A also tends to emerge in the acini periphery, at the border with the stromal connective tissue, while the islets are almost negative for VEGF-A. Conclusions: We can state that the decreased expression of T- and B-lymphocytes in normal pancreatic tissue, surrounding the necrosis areas, can be used as an aggravated prognosis factor for patients diagnosed with acute pancreatitis. Moreover, the increased immunohistochemical expression of VEGF-A can play an important role in tracking the evolution and pathology of acute pancreatitis. Currently, immediate loading of dental implants is very attractive as a standard protocol for prosthetic restorations in edentulous patients. The aim of this study is to find out the intimate peri-implant mucosa response depending on timing of implant loading, immediate or delayed. Fifty-one screw implants Alpha Bio (Alpha-Bio Tec, Israel) were inserted in 42 partially edentulous patients according to standardized surgical techniques. At six months of loading, samples of peri-implant mucosa were harvested from 27 immediate loaded, respectively 24 delayed loaded implants, and subjected to microscopic examination. Peri-implant mucosa in both loadings revealed a continuous and stable stratified squamous epithelium with moderate acanthosis and slight hyperkeratosis. Severe fibrosis and tendency to scar-like lesions were present mainly in immediate loading. Slight to moderate density of inflammatory chronic cell populations of non-uniform feature was common to both loading protocols. As compared to lymphocytes, higher scores of plasma cells were encountered in immediate loading. In immediate and delayed loading, the peri-implant mucosa as a new generated structure does not reveal different tissue responses. After six month of prosthetic loading, the healthy peri-implant mucosa is compatible with fibrosis and minor chronic inflammatory reactions. Diabetes mellitus is a disease that brings numerous alterations in the human body, mainly on the blood vessels and nervous system, its complications being difficult to treat most of the time. Oral complications are largely known and studied. Changes that occur in the dental pulp are of importance for the dentists, considering regular procedures outcome. In early stages of the disease, new blood vessels appear especially under the odontoblasts layer as a reaction to stimuli. In later stages, the defense systems of the dental pulp are outnumbered, nervous branches will be destroyed and disorganized. When periodontal disease occurs as well the mortification of the dental pulp will be faster. Chronic root fractures are a relative frequent dental condition, occurring both in vital teeth and in teeth with root canal treatment, with a difficult and frustrating diagnosis. Two clinical forms are described: crown-root fractures with crown origin and vertical root fractures with root origin. The aim of the study was to determine the prevalence of the root fractured extracted teeth in two dental clinics with different profile [oral rehabilitation (OR) and endodontics (E)] and to present some particular aspects of the root fractures. A retrospective study over a period of five years was performed to determine the number of extracted teeth and the motives for extraction. For root fractured extracted teeth were noted: fracture type, tooth vitality, restoration type. Although the number of the patients with tooth extractions in the five years period was significantly higher in OR clinic than in E clinic, the number of tooth extractions was almost similar. Most of the teeth (70.6%) were extracted for caries complications. The prevalence of the root fractured extracted teeth was 17.93%. In OR clinic, women had more root fractured extracted teeth compared with E clinic, where the number of root fractured extracted teeth was higher in men. Most extracted teeth for root fracture were teeth with prosthetic restorations followed by teeth with root canal treatment and dental fillings. The most extracted teeth for root fracture were maxillary premolars, almost similar for both sexes, followed by mandibular molars. The teeth with least extractions for root fractures were mandibular incisors and mandibular canine. Background and Aims: Experimental research and clinical data support the potential combination therapy for the treatment of neuropathic pain. We aimed to investigate the analgesic effect of the following associations: gabapentin + etifoxine; tramadol + etifoxine; gabapentin + tramadol, in an experimental model of peripheral neuropathy induced by paclitaxel. Materials and Methods: Neuropathy was induced in male Wistar rats by the daily administration of 2 mg/kg body weight (bw) paclitaxel intraperitoneally, four days in a row. Analgesics were given concomitantly with paclitaxel, in the following doses: tramadol 15 mg/kg bw, etifoxine 100 mg/kg bw, gabapentin 300 mg/kg bw. Tactile allodynia and mechanical hyperalgesia were assessed using the Dynamic Plantar Aesthesiometer apparatus (Ugo Basile). After 18 days of treatment, the brain and liver tissue susceptibility to lipid peroxidation was evaluated and the sciatic nerve histological examination of the effect on myelin fibers was performed. Results and Conclusions: Experimental data have shown a strong analgesic effect of these three tested combinations expressed mainly by the statistically significant increased maximum response time, both in the assessment of allodynia and hyperalgesia. The gabapentin + tramadol combination lead to the maximum analgesic effect, immediately after the discontinuation of paclitaxel (44.94%, p<0.0001) and throughout the study. The treatment associated with tramadol caused a reduction in lipid peroxidation in the brain as compared to paclitaxel group. Combination therapy showed reduced damage to myelinated fiber density in the sciatic nerve. The drug combinations used in the experiment showed therapeutic potential in the fight against neuropathic pain induced by the administration of taxanes. Mammalian target of rapamycin (mTOR) and autophagy have been implied in trophoblast cells proliferation and invasion. This study investigated whether mTOR and autophagy were involved in placental development and fetal programming. A total of 90 term normal placentas (37-42 gestational weeks) were collected from women who underwent elective cesarean section, with large for gestational age (LGA), fetal growth restriction (FGR), and appropriate for gestational age (AGA) infants (n=30, respectively). Capillary volume density within peripheral villi significantly decreased in the FGR placentas compared with the AGA group (p<0.01). Autophagic vacuoles were more prominent in the FGR placentas than in the AGA pregnancies (p<0.001). LC3B-II and Beclin1 in placentas of FGR were increased by 99% and 83%, respectively, while p62 was descended by 39% (p<0.001), compared with that in the AGA group. Whereas, there was no significant differences in these autophagy-related proteins between the LGA and AGA pregnancies. Compared to the AGA pregnancies, placental mTOR was reduced by 30% in the FGR group and raised by 26% in the LGA group (p<0.05). Pearson s correlation analysis showed a significantly inverse correlation between mTOR level and LC3B-II expression (r=-0.456, p<0.01), as well as between mTOR and Beclin1 expression in term human placentas (r=-0.468, p<0.01). These results demonstrate that altered expression of mTOR and autophagy may be associated with the development of placentas and pathophysiology of FGR, and that there may be a reciprocal regulation between mTOR and autophagy in human placentas. Induced differentiation of definitive endoderm (DE) from embryonic stem cells (ESCs) has been the recent focus of studies investigating regeneration and transplantation of organs of the digestive system. Poor cell survival is the most important challenge to DE differentiation from ESCs. This study aimed to optimize culture conditions to promote the differentiation of mouse ESCs into DE, and to investigate the roles of the Wnt and Nodal signaling pathways in the DE differentiation. The mouse ESCs were treated with or without leukemia inhibitory factor, Wnt3a and Activin A alone or together, and examined the DE differentiation by the DE marker CXCR4 and the ESC marker Oct4. The result showed the optimal induction of differentiation was achieved in cells simultaneously treated with Wnt3a and Activin A. Induction of CXCR4 was also earlier when there was simultaneous activation of Wnt and Nodal signaling compared to the groups treated with only Wnt3a or Activin A alone. These findings provide the basis for the induced differentiation of ESCs for the generation of functional, mature cells of gastrointestinal lineage, which can be potentially used for cell replacement therapy, disease modeling, as well as drug discovery studies. Purpose: Chronic dacryocystitis (CD) is an inflammation of the lacrimal sac and nasolacrimal duct with a long-standing evolution. The aims of this study were to analyze the epidemiology and to evaluate the histopathological features and the chronic inflammation score (CIS) system of chronic dacryocystitis in the region of Moldavia, Romania, over a period of 16 years. Methods: We conducted a retrospective descriptive analysis of all pathological reports of chronic dacryocystitis from the Department of Pathology, Prof. Dr. Nicolae Oblu Emergency Clinical Hospital, Iasi, Romania, between January 1, 1999 and December 31, 2015, with the final application of CIS. We also recorded the demographic information of patients and lesion localizations. Results: Eighteen cases of CD were identified, with a female:male ratio of 8:1. Patient median age was 66.27 years (range 33-83 years), 55.55% being in their eighth and ninth decade of life. A non-systemized growth trend starting with 2002 could be identified. Microscopically, several histopathological features were identified, some of them being associated: epithelial lining hyperplasia with pseudopapillary folds (77.77% of the cases), epithelial invaginations in the submucosa (11.11%), squamous metaplasia (16.66%) or partial denudation (33.33%). The sac wall revealed chronic diffusion (88.88%) or nodular lymphocytic inflammation (11.11%). 5.55% of cases presented fibrosis in the lacrimal sac wall with few lymphocytes. Applying CIS system, the majority of cases (13 patients, 72.22%) were identified with moderate chronic inflammation, only one case (5.55%) pointed out a mild degree of inflammation with a CIS<3, but four (22.22%) cases showed severe inflammatory changes with a CIS>6. Conclusions: In our region, CD is more frequent in senior women, probably due to their deficient immune system. Histological specimens of CD are not commonly found in practice of pathologists, but when the histological sections are analyzed they reflect a multitude of aspects that need to be known in order to guide ophthalmologists in their practice. In our region, CD is more frequent in senior women, probably due to their deficient immune system and to the specific anatomy of their nasolacrimal duct. The histological appearances varied from patient to patient and even in the same patient varied from one area to another. There were histopathological changes indicating adaptive changes, which could lead to the development of malignant tumors at this level. Therefore, there is a need for patient education with CD both in terms of ophthalmic hygiene and in what regards possible complications in the absence of a regular presentation to the ophthalmologist. Muscular metastases are rarely found in medical practice, and the reported cases in literature are not numerous. The diagnosis of these lesions involves an interdisciplinary collaboration. We present a case of secondary determination in the psoas muscle, with a starting point of cervical squamous carcinoma. In establishing the diagnosis, there contributed the clinical, imagistic and magnetic resonance evaluation and computed tomography (CT), the histopathological diagnosis being determined after the CT-guided biopsy puncture. The presence of hepatic arterial variations is particularly important for patients undergoing cephalic pancreaticoduodenectomy, because it can lead to unnecessary incidents or postoperative complications. We present the case of a patient with pancreatic head neoplasm in which the cephalic pancreaticoduodenectomy was performed and the origin of common hepatic artery from superior mesenteric artery, with an anterior, prepancreatic course. The case study of peripheral and axial gouty arthritis is described in a 52-year-old man without concomitant clinical evidence of tophaceus gout on physical evaluation on admission. Gout is a metabolic disorder related to excess of uric acid in the extracellular compartment, and deposition of monosodium urate crystals in the joints and other sites. Arthritis and tophi are major manifestations, which more often involve the peripheral joints asymmetrically. Chronic tophaceous gout commonly develops after a decade of recurrent polyarticular gout. With lower frequency, the axial skeleton (spine and sacroiliac region) may be affected, condition sometimes associated with additional concerns, diagnostic challenges and pitfalls. Higher suspicion index and utilization of novel radiographic tools can settle these matters. Radiographic imaging exams include plain radiography, computed tomography (CT), magnetic resonance imaging (MRI), and bone scintigraphy to show bone erosion and joint lesions characterizing the spectrum of gouty osteoarthropathy. Keratoacanthoma centrifugum marginatum (KCM) is a very rare variant of keratoacanthoma characterized by progressive peripheral growth accompanied by central healing. The tumor has the peculiar ability to involute spontaneously. A careful differential diagnostic with other skin carcinomas or hyperkeratotic lesions is required in order to ensure appropriate clinical management. We report a case of KCM in a 62-year-old man presenting with a solitary, large exophytic, sessile tumor located on the ventral side of the right lower leg, which developed over the course of one year from an initial erythematous papule. The patient presented history of local trauma. To our knowledge, this is the second report in the scientific literature supporting a possible traumatic etiology. Due to its rarity and lack of distinctive histopathological features, KCM poses a difficult diagnostic challenge. Therefore, the importance of an accurate histopathological examination and extensive use of ancillary studies for differential diagnosis is emphasized. Multiple malignancies are an increasing combination in the recent years in cancer patients, due to prolonged survival rate and to the advances in diagnostic techniques and therapeutic management. We present the case of a patient diagnosed with prostate cancer and metachronous in one year with basal cell carcinoma of the skin and small lung cell carcinoma with lymph nodes and pararectal metastasis. To our best knowledge, this is the only case presented in the medical literature with these three different types of primary malignancy. In conclusion, multiple malignancies in the same patients are a real challenge to the physician, because an early diagnosis and specific treatment modalities are essential for successful patient management and increasing life expectancy. Spontaneous cholecystocutaneous fistula (SCF) is a rare complication of neglected calculous biliary disease and also an extremely rare complication of gallbladder neoplasm. This pathology has become even rarer because of prompt diagnosis and expedient surgical intervention for gallstones. So far, there is one published report of a SCF due to gallbladder adenocarcinoma. We present the case of a woman aged 87 years, admitted to the Vth Department of Surgery, Clinical Municipal Hospital of Cluj-Napoca (Romania) for a tumoral mass located in the epigastrium. In the epigastrium, the patient had three skin orifices of about 1-2 mm each, through which purulent secretion occurred. The abdominal ultrasound highlighted a cholecystocutaneous fistula with the presence of a subcutaneous gallstone. Intraoperatively, we found a cholecystocutaneous fistula, a 1 cm subcutaneous gallstone, gallbladder with thickened walls containing a cylinder-shaped gallstone of 5/3 cm. Fistulectomy, gallstones extraction and cholecystectomy were performed. The histopathological examination highlighted gallbladder adenocarcinoma. In conclusion, SCF can be the first significant manifestation of gallbladder cancer associated with neglected calculous biliary disease. Dirofilariasis is a zoonotic worldwide-distributed disease, especially in regions with warm to temperate climate, where it recently recorded a significant increase of prevalence. A 61-year-old female, a dog owner, residing in the Southwest of Romania, near a swamp, developed a painless nodule in the left temporal region. The contrast-enhanced computed tomography (CT) scan revealed a temporal intramuscular cystic lesion. The surgical exploration confirmed the lesion as with intramuscular localization. The histopathology and biochemistry investigations established as a cause of the lesion an infestation with Dirofilaria repens species. The patient underwent an anthelmintic treatment with Diethylcarbamazine and the clinical and radiological follow-up did not revealed any recurrences within a period of 15 months after surgery. 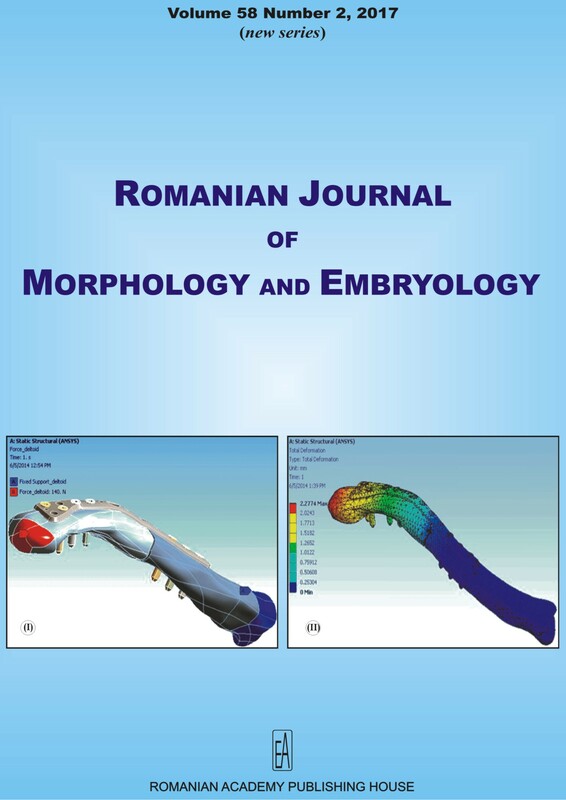 This is the second case reported in Craiova (Romania), the seventh worldwide reported case with localization in the temporal region, and the second one with intramuscular development in this region. The existence of such cases should alert the clinician to include parasitosis in the differential diagnosis of atypical space-occupying lesions of the head regions. Clavicle fracture reported incidence is about 5% of fractures in adult; among them, those located in the middle third of the shaft represent more than 80% from the total of cases. Due to the special morphological and biomechanical constraints of the clavicle, several methods for restoring morphological integrity in these fractures are described, including conservative, non-surgical treatment. The last 10 years of clinical studies in the field have favored the surgical treatment for selected cases; several osteosynthesis implants are in use - mostly anatomical plates with specific advantages and documented complications. A failed anatomical clavicle plate was explanted and analyzed after a protocol using stereomicroscopy, scanning electron microscopy and energy dispersive spectrometry. Based on the computed tomography (CT) scan determination of patient morphological parameters, a finite elements analysis of the failure scenario was completed. The failure analysis has proved that the plate breakage had occurred in the point of maximal elastic stress and minor deformation. The clinical implication is that no hole should remain free of screw during clavicle plate fixation and the implant should be chosen based on patient morphological parameters. In comminuted clavicle fracture, anatomic bridging with locked plate technique may lead to implant failure due to increase of the stress in the midshaft area. Thorough knowledge of anatomy and morphology of complex bones like the clavicle is necessary. Modern osteosynthesis anatomical implants are still to be improved. Sebaceoma associated with seborrheic keratosis has only been described once in the literature. Herein, we present an additional case in a 69-year-old woman who complained of a multicolored plaque on the left breast. Dermatoscopy showed a central orange lesion with orange globules suggestive of dilated glands. The periphery of the lesion was brown and gray, with some more pigmented zones. The histopathological study demonstrated a seborrheic keratosis in the peripheral areas, whereas the central part of the lesion was a sebaceoma. We performed an immunohistochemical study with antibodies against MSH6, MSH2, MLH1, and PMS2, which demonstrated preserved nuclear expression of the mismatch repair proteins, therefore ruling out Muir-Torre syndrome. We present the particular clinical and histological features of a metastatic high-grade myxofibrosarcoma (MFS) of the left buttock in a 77-year-old male patient. The tumor was biopsied and surgically removed in order to increase the patient s comfort, due to its increased size and aggressive clinical behavior. Computed tomography (CT) revealed metastases in the pleura and mediastinal lymph nodes, so limb-sparing tumor excision followed by palliative care was the best practice for the patient until the fatal outcome. The histological assessment revealed a tumor composed partly of solid sheets of spindled and pleomorphic cells, partly of areas with prominent myxoid matrix and numerous elongated capillaries. Mitotic figures are frequent, often atypical, followed by numerous giant cells with abundant eosinophilic elongated cytoplasm, resembling myoid cells often multinucleated. A panel of immunohistochemical stainings, including muscle-specific actin (MSA), S-100, CD34, desmin and myogenin were performed with a negative result, which aided excluding other soft tissue tumors like rhabdomyosarcoma and leiomyosarcomas, while Ki-67 was highly expressed in more than 70% of the tumor cells. This tumor received 6 points in accordance with the Federation Nationale des Centres de Lutte Contre le Cancer (modified FNCLCC) and was defined as a high-grade MFS [stage IV, G3 pT2bN0M1, according to the 8th edition of TNM Classification of Malignant Tumors, ICD-O 8811/3 in World Health Organization (WHO) Classification 2013]. Due to the clinical findings combined with the histological profile, the fatal prognosis was expected, though the time period was shorter than predicted, confirming the aggressive nature of the tumor. Even if traditionally was considered MFS as a non-metastatic lesion, recent case reports and studies, including our case revealed that this tumors in fact have the potential to be fatal due to metastatic disease. The pathogenesis of gastric cancer regardless of histological structure is a classic example of gene-environment interaction, and an important epidemiological aspect was the recognized association with Helicobacter pylori infection. This paper describes a case of gastric mucosa-associated lymphoid tissue (MALT) lymphoma in a young patient whose first sign of the disease was upper gastrointestinal bleeding and associated hemorrhagic shock. The patient is a 31-year-old man, diagnosed by endoscopy 10 years ago with H. pylori-positive chronic atrophic gastritis, who refused treatment to eradicate the bacterium and presents currently in the emergency room for serious upper gastrointestinal bleeding. Emergency upper gastrointestinal tract endoscopy highlights the presence of bleeding gastric tumors. It was a surgical emergency and intra-operatively the presence of invasive gastric cancer into the left hepatic lobe was noted which required total gastrectomy with the purpose of hemostasis. Immediate and remote postoperative evolution was favorable and post-operative follow-up at six months, 12 months, and 24 months showed no signs of local or distance occurrence. Leiomyosarcoma is a rare condition so there are relatively few and small case series and no prospective studies to provide clear guidelines regarding management. We report on a case that presents some particularities that further underline diagnostic and treatment difficulties posed by the affliction of such a rare tumor. This is the case of a 43-year-old woman who had a large tumor arising from the uterus, with a spectacular growth rate over a short period. The patient, with congenital spastic tetraparesis and hydrocephalus, came for belly enlargement with rapid increase in size over the previous two months. Physical exam and ultrasound lead to the conclusion of a large abdominal mass. A computed tomography scan showed a mass arising from the pelvis and a large amount of ascites. An exploratory laparotomy was performed and the histopathology report confirmed the diagnosis of uterine leiomyosarcoma. Leiomyosarcoma poses challenging problems regarding histological grading and, due to its rate of growth, real surgical difficulties. Final diagnosis is done by histopathological examination after surgical excision. Frequently, it is late diagnosed when complete removal of the tumor is often impossible. Hypersensitivity pneumonitis (HP; extrinsic allergic alveolitis) is a rare non-immunoglobulin E (IgE)-mediated inflammatory lung disease caused by inhalation exposure (occupational, recreational or ordinary home exposure). A 36-year-old female patient, without significant medical history, is referred to an outpatient pulmonology clinic for dry cough, shortness of breath, fever, fatigue and weight loss. Chest high-resolution computed tomography (HRCT) was performed, and significant lung fibrosis (especially centrilobular and interlobular in bilateral thick lines), traction bronchiectasis and alveolitis in both superior lobes are described. Lung function tests showed severe restrictive dysfunction. Transfer factor of the lung for carbon monoxide (TLCO) being very low, the flexible bronchoscopy was contraindicated. Surgical lung biopsy was performed. Histopathological examination showed characteristic lesions of chronic bilateral hypersensitivity pneumonitis. The patient died four days after the surgical intervention due to post-operative complications. Exposure to various chemical substances can form bonds with human proteins molecules and induce an exaggerated immune response in susceptible individuals. A high index of suspicion of occupational exposure can determine an early diagnosis with a better outcome. Abdominal lipomas are benign mesenchymal tumors of mature fatty tissue that may appear at any age. We present the case of a 58-year-old patient with a cardiovascular pathology, who presented with diffuse abdominal pains, asthenia, anterior thorax pains and palpitations, abdomen increase, symptoms that had an insidious onset. The clinical and imagistic examinations suggested the diagnosis of giant abdominal lipoma. The surgical intervention allowed the excision of an encapsulated tumor, of 250/220/230 mm, relatively well encapsulated, with a macroscopic aspect of section adipose tissue, with hard whitish areas, with a 12.3 kg weight. The histopathological examination confirmed the diagnosis of lipofibroma. Primary neuroendocrine tumors of the extrahepatic bile ducts are extremely rare - up to date, only 77 cases have been reported in the literature, which represents between 0.2-2% of all gastrointestinal carcinoid tumors. The paper focuses on the case of a woman patient, aged 37 years, admitted to the Clinic with the diagnosis of obstructive jaundice, unaccompanied by pain and where imaging indicates a tumor in the third average of the common bile duct (CBD). The surgery involved the excision of CBD, lymphadenectomy and restoring the biliodigestive continuity of Roux-en-Y hepaticojejunostomy. The histopathological and immunohistochemical examinations revealed the presence of a well-differentiated neuroendocrine tumor of CBD. Based on the case report and literature, we attempted to accurately identify and relate this type of tumor to other varieties encountered in the extrahepatic bile ducts, pointing out elements of a positive diagnosis, differential diagnosis, histopathology and immunohistochemistry, and referring to the therapeutic attitude, evolutionary methods and prognosis. Breast cancer is the most frequent cancer diagnosed among women; its association with pregnancy is not encountered. As childbearing age is increasing, the diagnosis of breast cancer associated pregnancy tends to be more often than years ago. Here we report a case of a 37-year-old patient, gravida 7, para 7, diagnosed at 30 weeks gestation with metastatic breast cancer. The patient presented to hospital due to an altered performance status. Obstetrical evaluation was within normal range. A metastatic infiltrating breast cancer poorly differentiated (G3) with satellite skin lesions (T4b), ipsilateral axillary and supraclavicular lymph nodes (N3), lung metastasis bilateral with pleural effusion and hepatic metastasis (M1), were diagnosed. The tumor was positive for estrogen receptor (ER) and progesterone receptor (PR) status and negative for human epidermal receptor protein-2 (HER-2)/neu immunostaining. Due to a significant worsening of the patient s dyspnea, a Caesarean section was performed under spinal anesthesia, at 30 + 2 days; and a newborn weighing 1700 g was delivered without malformations. The unsuccessful management of the cancer was inevitable and the patient died two weeks later. Despite her hospitalizations for six prior deliveries (last birth was one year ago), the presence of a palpable tumor was never observed. We aim to highlight the importance of the clinical examination at any given point in pregnancy in order to detect, investigate and treat any suspect tumor of the breast. Apocrine hidrocystoma (AH) is an uncommon benign cystic tumor that is rarely located in the genitalia. We present the case of a 52-year-old uncircumcised man who presented an AH on his foreskin. The lesion was non-proliferative. Including the present report, only 10 cases of penile AH have been published to date. Most patients are adult (mean age 39.2 years, range 25-56 years) and only one case in one child and another case in one adolescent have been reported. The lesion involves more commonly the foreskin followed by the shaft. The average maximum diameter was 1.6 cm (range 0.3-3 cm). The majority (70%) of tumors are unilocular. The main differential diagnosis of AH includes eccrine hidrocystoma, epidermal inclusion cyst and male median raphe cyst. Complete excision of the lesion is curative. Here we present a challenging case of a hepatic flexure colon tumor of 61-year-old woman with no primary lesion of lung cancer. Immunohistochemistry was applied and 50 genes were analyzed by next-generation sequencing (NGS) technology. The tumor contained medium to large size neoplastic cells with evident nucleoli to be diagnosed poorly differentiated neuroendocrine predominantly large cell carcinoma of colon [G3: World Health Organization (WHO) 2010] (pT3 N0: 7th edition pTNM). Cytokeratin (CK) AE1/AE3 staining was predominantly membranous with partial distribution in dot-like pattern in perinecrotic cancer fields to be reminiscent of small cell carcinoma. Ki67 labeled over 90% of cancer cells with partial positive nuclear staining for thyroid transcription factor-1 (TTF-1). Using NGS, the following mutations were detected: nonsense mutations in four tumor suppressor genes [APC R1114X (molecular argument that the cancer was a primary tumor of colon), TP53 R213X, RB1 E137X and FBWX7 R393X and S282X], mutations in three receptor tyrosine kinases (RET A919V of high transforming activity, EGFR E114K and FLT3 L601I) well known as oncogenes. We present the case of a 71-year-old right-handed male, admitted to the Department of Neurology, Emergency County Hospital of Arad, Romania, on November 2015, with a rare case of Kluver-Bucy syndrome (KBS), following an ischemic stroke of the right temporal lobe, which was previously diagnosed in December 2014 and was treated accordingly. At the moment of second hospital admission, the patient was found somnolent and confused at home, with traumatic signs of biting of the tongue and urine emission. A couple days after admission, our patient became alert and presented hypersexuality, hypermetamorphosis, increased oral tendency, behavior changes including apathy with loss of anger and fear, and a very increased appetite, transient visual agnosia and right-left disorientation. In the initial phase, the patient could not recognize any members of his family, but he had a tendency to touch everything within his reach and place it into his mouth. The KBS presented in this case, following an ischemic stroke of the right temporal lobe provides distinct and intriguing insights into the possible pathophysiology of this syndrome. Often disruption of consciousness during recovery period may hide the clinical manifestation of the syndrome. In recent years, there is a growing evidence that using 5-aminolevulinic acid (5-ALA)-guided resection of a cerebral glioblastoma, associated with chemoradiotherapy determine a prolonged survival of these patients, even though this period do not exceed 15 months. 5-ALA is a natural biochemical precursor of heme that is metabolized to fluorescent porphyrins, particularly protoporphyrin IX (PPIX) and no foreign reaction were noted until now. However, foreign body reaction developing in neurosurgery is documented in a few number of cases to suture material, surgical hemostatic material, or surgical glove starch, but up to now we could not find any article about granulomatous inflammation to polyglycolic acid (PGA) suture after brain tumor resection. Here we present a case of a delayed foreign body granuloma to PGA suture diagnosed after 10 months following fluorescence-guided surgery with 5-ALA for resection of a cerebral glioblastoma that was difficult to diagnosis both clinically and on magnetic resonance imaging (MRI). Moreover, the survival time was longer. We correlate the appearance of foreign body granuloma with the patient s persistent pre- and postoperative lymphocytosis. We also suggest that the chronic inflammation inhibited the proliferation of any tumoral cells which could remain in the tumor bed because we did not noticed on serial MRI scans a rapidly tumor growth during the first 10 months after the initial surgery as we have expected to be for a glioblastoma. Stevens-Johnson syndrome (SJS) is a cutaneous mucosal disorder characterized by extended necrosis and detachment of the epidermis affecting <10% of the body surface, caused by drugs or infections. The authors report a case of a girl with Depakine resistant epilepsy, who develops a SJS in the third week of introducing lamotrigine. The girl also presents an acute diarrheal disease with double viral etiology - rotavirus and norovirus. The clinical image comprises polymorphic erythematous maculopapular exanthema with vesicular and bullous elements, with ulcerations and desquamations at the level of the eyelids, mouth, anogenital area and tegument denuding at the level of the abdomen and limbs. The SCORTEN score (SCORe of Toxic Epidermal Necrosis) for establishing the seriousness is 1. The evolution of the disease is slowly favorable under conservative treatment, which does not involve the use of corticotherapy or intravenous immunoglobulins. Although there is a low incidence of this syndrome in pediatrics, it may occur as complication of using some drugs - mostly anti-epileptics or antibiotics, corroborated or not with an infectious process. Objectives: Patients with Helicobacter pylori (HP) infection have been reported to have in addition to duodenitis architectural changes of the duodenal bulb mucosa including villous atrophy and crypt hyperplasia. We here for the first time present two cases of HP-infected adult patients with a crypt hyperplastic enteropathy also in the distal duodenum mimicking celiac disease (CD). Methods: We evaluated separately the morphology of the anatomical bulb and distal duodenal mucosa using validated quantitative morphometric tools, i.e., the villous height (VH) and crypt depth (CrD) and their ratios. The fresh frozen samples were evaluated for the presence of the CD-specific transglutaminase 2-targeted subepithelial IgA deposits. Results: Both patients had celiac-type crypt hyperplastic mucosal injury in the distal part of the duodenum in the absence of serum autoantibodies and subepithelial IgA deposits. After two years follow-up, having still a normal gluten-containing diet, none of the patients developed CD. Moreover, in the patient re-biopsied two years later, the CD-type enteropathy had healed after HP eradication. Conclusions: Prospective studies on HP-infected patients are needed in order to confirm our findings. The role of arthroscopic surgery for the treatment of various orthopedic pathologies has greatly improved during the last years. Recent publications showed that benign bone lesion may benefit from this minimally invasive surgical method, in order to minimize the invasiveness and the period of immobilization and to increase visualization. Unicameral bone cysts may be adequately treated by minimally invasive endoscopic surgery. The purpose of the current paper is to present the case report of a patient with a unicameral bone cyst of the calcaneus that underwent endoscopically assisted treatment with curettage and bone grafting with allograft from a bone bank, with emphasis on the surgical technique. Unicameral bone cyst is a benign bone lesion, which can be adequately treated by endoscopic curettage and percutaneous injection of morselized bone allograft in symptomatic patients. Everyone s right to life shall be protected by law, states the article 2 of the European Convention of Human Rights (1950). This article guarantees the protection of life of all persons. The human embryo, however, does not seem to be under the protection of this article, or, at least not always. The human embryo does not have a nature clearly defined and it is not considered always as person. The law protects only two categories by its ordinary regulations: things and persons. Our main objective is to find out if the human embryo is or not protected, according to the legal framework in Romania. The purpose of the paper is: (1) to familiarize professionals with current debate on the status of the human embryo; (2) to provide main legal standards and regulations concerning this specific area with examples from case reports; (3) to summarize causes and consequences of the human embryo legal interpretations. Our conclusion is that the human embryo is not protected by the law in force at this moment, with very few exceptions. It depends, most of time, on the parent s wishes. From ethical point of view, we are in front of an open and long debate. The law should regulate and define the human embryo in a clear way. Legal standards are extremely necessary for all involved, in the context of the development of the medicine. Embryo s issues have profound implications for medical practice.